Beat the eggs, sugar and lemon juice until the mixture turns pale and thickens, add the oil. Whisk the egg whites until firm enough to cling to the tip of the whisk, then incorporate the sugar in two batches and whisk to stiff peaks. Gently fold into the egg mixture, fold in the sifted flour and baking powder. Spread the lemon ‘biscuit’ sponge to a thickness of 1 cm on a tray lined with baking parchment. Bake for 10 minutes. Remove from the oven and leave to cool with the baking parchment on a rack. Soften the gelatine leaves in a bowl of cold water. Heat the lemon juice and peel in a pan. In a bowl, whisk the egg and sugar. Add the hot lemon juice and peel and mix. Pour the mixture into a pan and cook, stirring constantly with the whisk until it comes to the boil. Remove from the heat. Squeeze the gelatine to drain and incorporate, then add the butter. Put the lemon cream in a bowl, film in contact with plastic film and refrigerate. Prepare a pastry cream: Whisk together the egg yolks and sugar, add the flour and cornflour. Bring the milk to the boil, remove from the heat and tip little by little the hot milk into the egg yolk-sugar mixture. Return to the saucepan and cook over a low heat, whisking continuously, until the cream thickens. Boil for 1 minute, stirring continuously, then remove from heat and add the praline. Tip into a hotel pan, film in contact with plastic film and leave to cool. Whisk the praline pastry cream to smooth, add the softened butter. Emulsify well. Set aside ¼ of the cream for decoration. Turn the lemon ‘biscuit’ sponge over on a clean sheet of baking parchment, remove the sheet used for baking. Finely spread the lemon cream on the ‘biscuit’ sponge. Cover the lemon cream with the ¾ praline mousseline cream to a thickness of 3 mm. 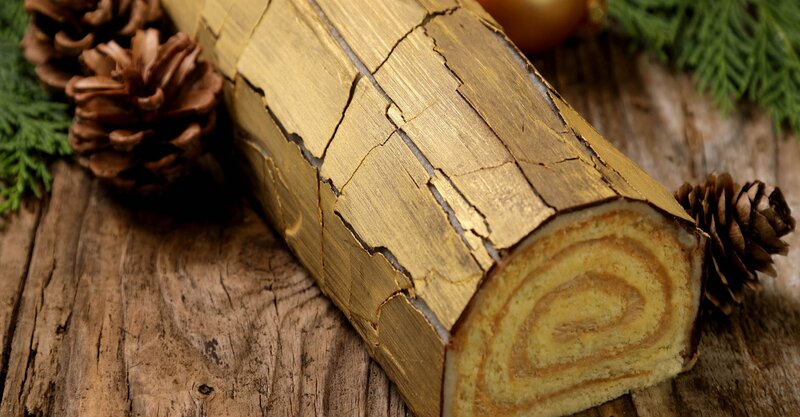 Use the baking parchment to help roll the the Yule log towards the centre from the smallest part. Be careful to tightly roll the Yule log. Refrigerate. Then smooth the remaining ¼ praline mousseline cream over the surface using a strip of baking parchment. Chop the dark chocolate. Heat 2/3 of the chocolate over a bain-marie until it reaches 45-50°C on a cooking thermometer. Remove from the bain-marie and add the remaining 1/3 chocolate. Stir until the added chocolate has melted and the temperature is between 30 and 32°C. Combine the almond paste with the lemon juice, lemon peel and fondant icing. On baking parchment lightly dusted with icing sugar, roll out a rectangle of 15 x 30 cm. Cover with tempered chocolate and leave to start setting for a few minutes. Mix together the gold powder and alcohol, brush on the partially set chocolate. Gently roll a rolling pin over the chocolate to break into pieces. Place the decoration on the Yule log, press gently to stick. Cut off the ends and any excess. Use a bent spatula to place the Yule log on a serving dish.